Environmental history is often characterized by the interdisciplinary character of its research. Since its earliest iteration in the 1970s, some of the leading scholars in field stressed the importance of integrating interdisciplinary insights into the study of the historical interrelationship between nature and society. In his 1990 article on the “new field of ecological or environmental history,” Donald Worster argued that “the environmental historian must turn for help to a wide array of the natural sciences and must rely on their methodologies, sources and evidence,” in order to understand the first level of his three-part model for doing environmental history, the study of nature itself over time. Worster’s model, however, limited its call for interdisciplinary research to bridging work in the humanities with the natural sciences. This, of course, overlooks the interdisciplinary interconnections between historical scholarship and other disciplines in the humanities. Environmental history research at the third level of Worster’s model, human perception and imagination of nature, can indeed benefit from the methodologies, sources, and evidence of other humanities disciplines. This was the purpose of the recent “Cross-Pollination” workshop held at the University of Alberta, an effort to bridge environmental research across the arts and humanities. More than thirty scholars from a number of different backgrounds, including historians, writers, literary critics, curators, environmental consultants, and visual artists, gathered to share their research with the goal of exploring possible connections across their respective disciplines. At first, I struggled to find these connections as I read some of the papers and listened to the presentations. Literary criticism and semiotic analysis of art fall relatively far outside my areas of expertise as a historian. Then again, so does ecology, paleobotany, climatology, and archaeology. I became more convinced of the scholarly benefits of interdisciplinary research within the humanities for environmental history, particularly as I read the work of Richard Pickard, Lianne McTavish, and Jingjing Zheng. Richard’s paper, titled “Whatever Else Climate Change is Freedom: Frontier Mythologies, the Carbon Imaginary, and BC Coastal Forestry Novels,” examined frontierism in early British Columbia fiction about forestry. He deconstructed the works of M. Allerdale Grainger’s 1908 novel, Woodsmen of the West and Roderick Haig Brown’s 1942 romance novel, Timber in order to uncover traditions in BC fiction that point to the interconnections between forestry labour and independence as a persistent characteristic of the industry that continues to influence debates over the role of forestry in climate change policy. Richard’s skills in literary criticism and ecocriticism, applied in this research, could be of tremendous benefit to environmental history research that looks at human perception and imagination of nature. This, of course, builds off of other leading scholars in the field of ecocriticism, including the work of Lawrence Buell. Similarly, Lianne McTavish, and Jingjing Zheng’s paper, “Rats in Alberta: Looking at Pest Control Posters from the 1950s” very effectively demonstrated the interdisciplinary common ground between art history, semiotic analysis, and environmental history. Their paper explored the visual history of the Alberta government campaign to eradicate Norwegian rats from the province in the 1950s. 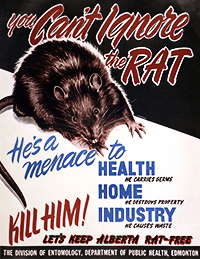 Using techniques of semiotic analysis, they made a persuasive case that these posters had the effect of teaching Albertans how to visualize and identify these rat species as a threat to the provincial economy and health. 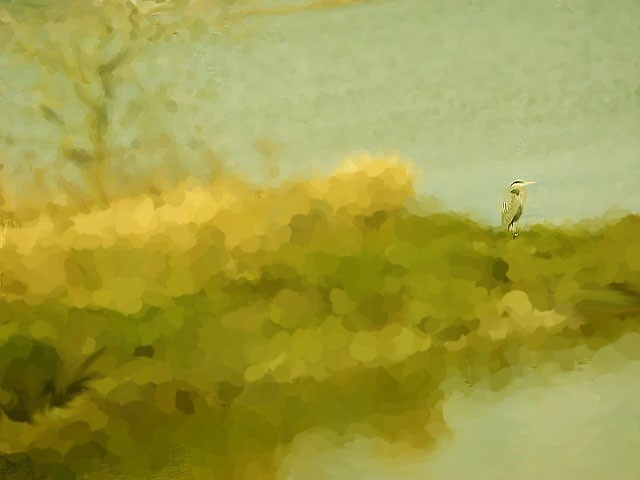 These works revealed to me some of the potential interconnections between environmental history and other disciplines within the arts and humanities. This, I think, is especially useful for that third level of analysis in Donald Worster’s model for environmental history, one which he characterized as “highly consequential, moving with all the power of great sheets of glacial ice, grinding and pushing, reorganizing and recreating the surface of the planet.” In order to better understand that more intangible, purely mental type of encounter between humans and the rest of nature, environmental historians should broaden their interdisciplinary approach to consider the methodologies, sources, and evidence from other disciplines within the arts and humanities as well as the natural sciences. Donald Worster, “Transformations of the Earth: Toward an Agroecological Perspective in History” Journal of American History 76 (4) 1990: 1088. Worster, Transformations of the Earth,” 1091. This, of course, overlooks the interdisciplinary interconnections between historical scholarship and other disciplines in the humanities.